When someone calls you lazy you may automatically get offended. Some of us may just accept that, while a little harsh, it is the truth. It’s hard sometimes to not be lazy in a world that moves so fast otherwise. It may even seem like a treat, slow down and take things easy for a while. Don’t get us wrong, it is a treat. However, sometimes our getaway can last a little too long. We may start to find we aren’t working as hard as we used to, we have lost some of our energy, or we just don’t feel like doing anything. At this point, you have fallen into the lazy trap. It is so easy to get stuck there and so comfortable, that it may be a task to pull yourself out. Do not despair though! 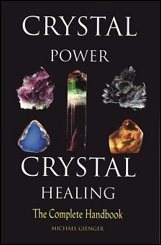 Healing crystals can help you conjure up the energy and motivation to cure yourself of laziness for good! Scarlet combines the energy of the pure red ray and the exuberance and joy of the orange in a precious gift of nature. 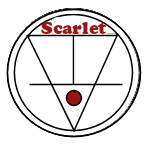 Scarlet is the color of strength and vitality, both physical and spiritual. Use Scarlet crystals when you need protection from physical harm. Travelers, watchmen, and all who have occasion to fear personal harm from attack or misfortune are well advised to use a scarlet crystal to focus their efforts at self-protection. It usually should be used with a dark green talisman for safety from accidents. Use scarlet-colored crystals in efforts to overcome fear and improve self-reliance. They are the crystals of victory, success, and skill. When your challenge is physical, and you need to focus and multiply your physical strength and stamina, use a crystal with the scarlet ray of influence. Athletes, soldiers, workers, and all for whom physical strength is vital can benefit from the rays of a scarlet crystal. Workout efforts can be enhanced and an overall increase in vitality will be observed with careful use of scarlet crystals. Weightlifters, body builders, and track and field competitors can gain significantly from these crystals. You may be thinking, “But I am here to cure laziness, not body build.” Fair point. However, what do you think pushes these athletes through their work out? Motivation, strength, and determination! Those are 3 vital attributes in curing laziness. While there strength found in scarlet crystals, energy can be found in the darker shades. Deep scarlet crystals are the key to the physical pleasures of maturity—in love, in life, and in relationships. Muted with the shades of black, brown, blue, or violet, deep scarlet crystals give us the natural sources of energy to enjoy life’s pleasures that extend past the joyfulness of youth. Enjoying life in maturity requires vitality. Faceted Agate, when it possesses the scarlet ray of influence, is a crystal of physical energy, vitality, and protection. It is a healing crystal of the base Chakra, a powerful fire element used in the south area of a home, and used in the devotions to several Goddesses. Agate is a Seeker Transformer Crystal. Seeker Transformers are talismans used when the desire is to find a way to transform a part of one’s life to a more desirable state. Seekers are used when we need some help to find a new path, a new approach, or in any quest to gain that which we desire but do not yet possess. 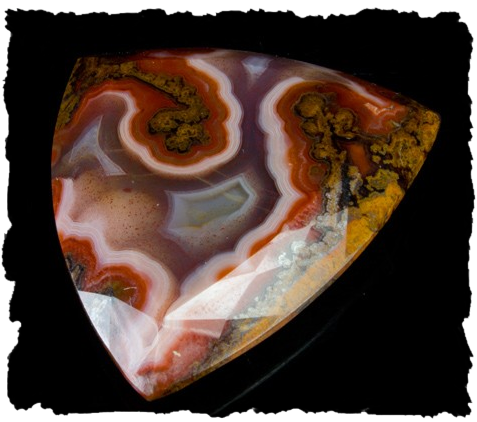 Agates are often small, and usually polished. They are absolutely perfect for personal talismans. Easy to carry in one’s pocket or purse. They are hard and durable. Brightly colored ones like the scarlet in Faceted Agate work best. Revered in many cultures throughout history, Ruby has always been a talisman of passion, protection and prosperity. It symbolizes the sun, and its glowing hue suggests an inextinguishable flame within the stone that legends claim would shine through even the thickest clothing and could not be hidden; if Ruby were cast into water it would cause it to boil, and if carved and pressed into wax, it would melt the wax. Wear or carry Ruby to overcome exhaustion and lethargy. It stimulates circulation and amplifies energy and vitality to the whole system. 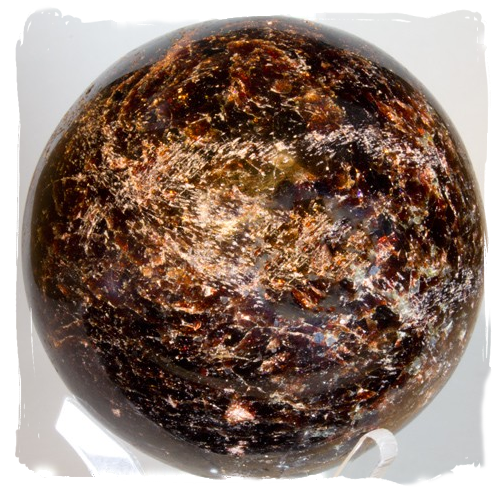 However, those who are highly sensitive or irritable may find this stone over-stimulating or uncomfortable to wear. If you are trying to cure laziness though, it seems to be just perfect. Ruby assists in connecting one’s energy field to the Earth for the purpose of replenishing one’s energy stores. It is excellent for grounding and overcoming mental overload, and is a great support during times of stress or when there is a lengthy sojourn before having the opportunity to rest. Faceted Agate, with its Scarlet Color Ray of Influence is associated with the First Chakra, the Base Chakra. This is the grounding Chakra and deals with the health of the physical body. Dark Scarlet Ruby crystals are primarily used for their Seeker power. They should be carried on your person or worn to help you focus the Universal Life Force on specific efforts to find new paths in life. 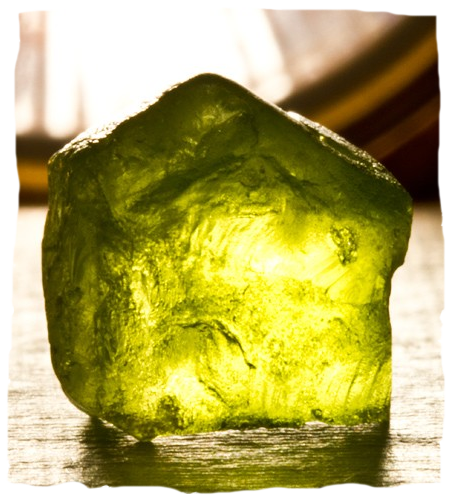 Judy Hall recommends Peridot which is the "Study Stone" used as personal talisman in efforts to concentrate on learning new skills and acquiring new knowledge. Mentally, Peridot sharpens the mind and opens it to new levels of awareness. It banishes lethargy, bringing to your attention all the things you have neglected consciously or unconsciously. Michael Gienger advocates Calcite which is a balancing and meditation stone for recentering after excessive exposure to powerful Yang environments. 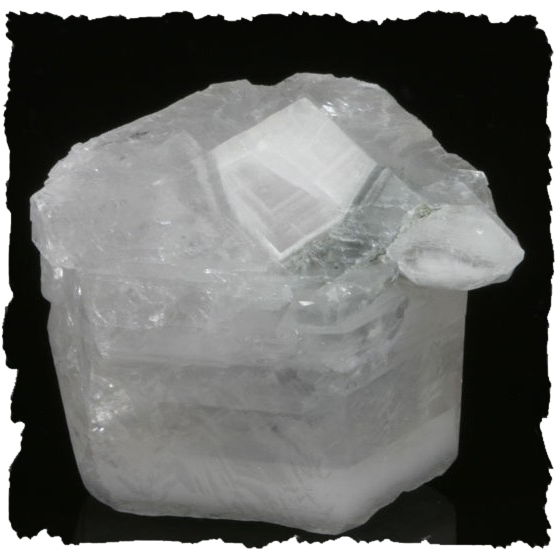 Calcite bestows stability, trust in ourselves, and constancy. It is effective against laziness and fortifies the ability to overcome difficulties. Melody advocates Zoisite which is to be carried or worn to provide a focus for Universal Life Force to enter your spirit. 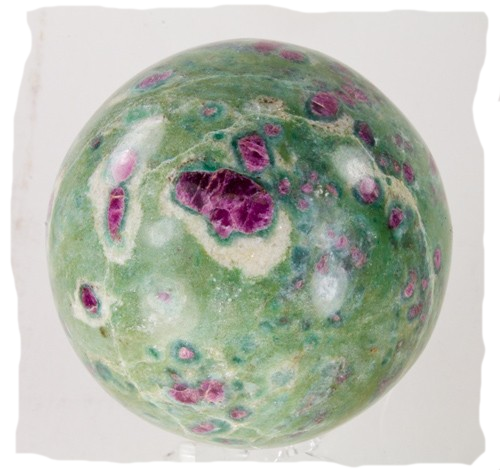 Zoisite can provide for decomposition of negativity and for transmutation of the negative energies to positive force-fields. It can be used to dispel laziness and idleness. Laziness is something that plagues us all at some point in our lives. 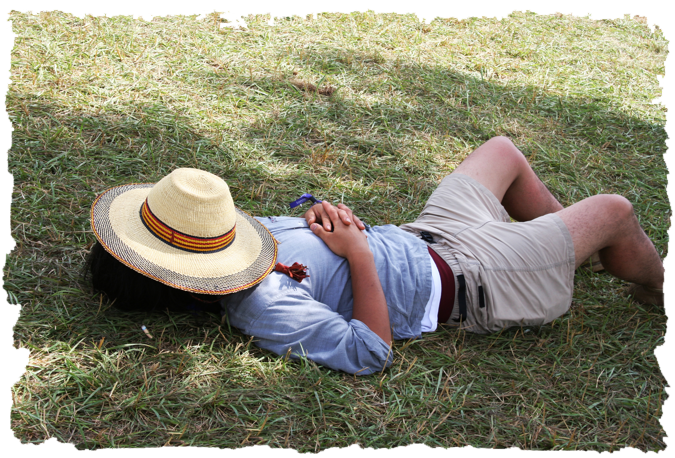 The stress and fast pace of things make our body and our soul tired and often times we just want to rest. However, sometimes it can be hard to get back up once that rest is over and laziness may start to set it. The powerful scarlet ray of influence can restore your vitality and bring you boundless energy to help cure laziness. We suggest using dark scarlet colored crystals such as Faceted Agate and Ruby. 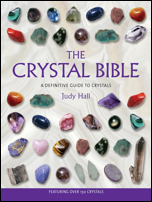 You can also try crystals that other authors have recommended such as Peridot, Calcite, and Zoisite.